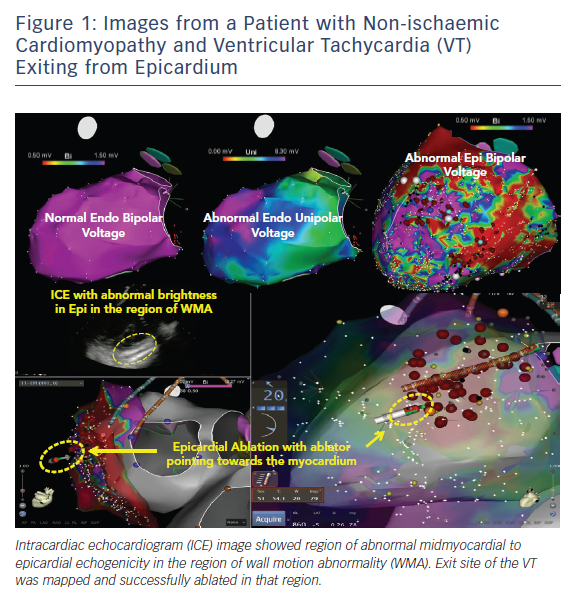 Epicardial ablation is needed to eliminate ventricular tachycardia (VT) in some patients with nonischaemic cardiomyopathy. 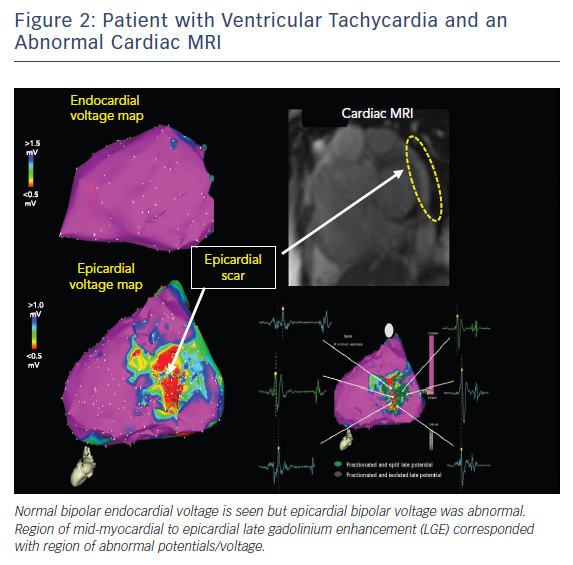 The 12-lead electrocardiogram of VT, pre-procedural imaging and endocardial unipolar voltage maps can predict a high likelihood of epicardial substrate and VT. A septal VT substrate may preclude the need for epicardial access and mapping and can be identified with imaging, pacing and voltage mapping. Pericardial access is usually obtained prior to systemic anticoagulation or after reversal of systemic anticoagulation. A unique set of complications can be encountered with epicardial access, mapping and ablation, which include haemopericardium, phrenic nerve injury, damage to major coronary arteries and pericarditis. Anticipating, preventing and, if necessary, managing these complications are paramount for patient safety. Best practices are reviewed. Support for this effort comes from the Katherine J Miller Research Fund, the Mark Marchlinski EP Research and Education Fund and the Pennsylvania Steel Company EP Research Fund. Ventricular tachycardia (VT) is one of the most challenging medical conditions faced by cardiac patients and physicians treating them. 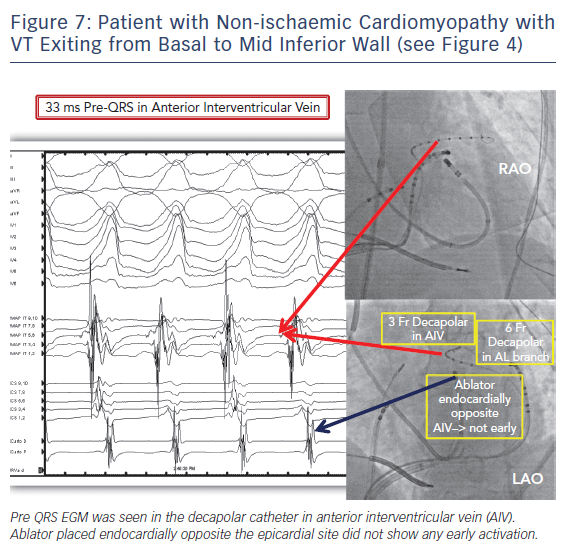 Antiarrhythmic medications have limited effectiveness and are frequently poorly tolerated.1–4 Catheter ablation is increasingly used to treat patients successfully.1,5–7 Most VTs can be ablated endocardially but some require epicardial mapping and ablation. 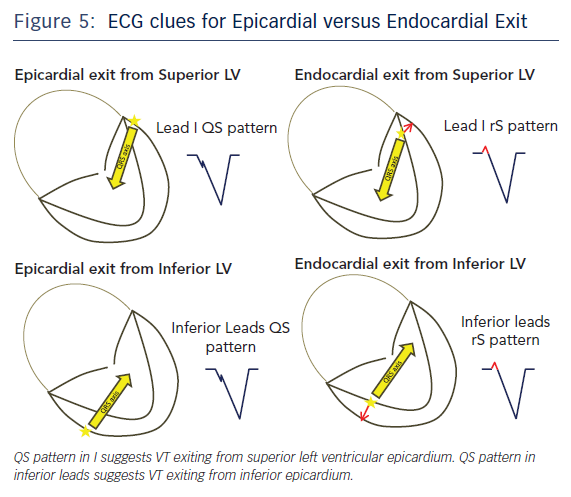 Electrophysiologists performing VT ablation need to know when to consider an epicardial approach, how to deal with anticoagulation during the procedure and ‘best’ techniques to minimise risk of procedural complications. 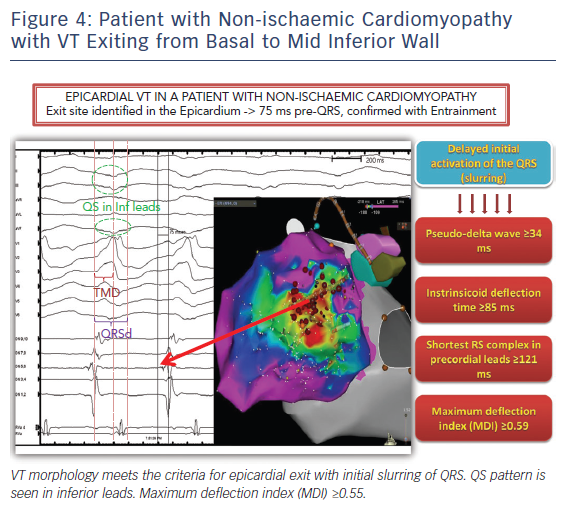 Patients with VT in the setting of ischaemic cardiomyopathy (ICMPY) generally have endocardial substrate that can be eliminated with endocardial radiofrequency lesions. Less commonly a critical component of the circuit is located epicardially in this setting and epicardial access is required. In contrast patients with non-ischaemic left or biventricular cardiomyopathy (NICM), who characteristically have perivalvular substrate, frequently have anatomic changes that either extend to the epicardium or are primarily epicardial in location, and require direct epicardial ablation.7–9 Other disease states with a high propensity for requiring epicardial ablation include patients with arrhythmogenic right ventricular cardiomyopathy (ARVC), cardiac sarcoidosis, Chagas disease and patients with a history of myocarditis.6,7,10–12 Patients with hypertrophic cardiomyopathy are unique in that apical scarring and epicardial substrate can be identified.13 Recently, there is evidence that epicardial right ventricular outflow tract may harbour substrate in patients with Type I Brugada syndrome and targeting this region may be beneficial to control VT/VF.14 The presence of any of these aforementioned disease states should raise the suspicion that epicardial m apping and ablation will be required. Pre-procedural planning is essential for any VT ablation. Cardiac imaging is performed most often prior to ablation procedures. Echocardiogram is useful in diagnosing the structural abnormality including regions of abnormal wall motion abnormality. Intracardiac echocardiogram (ICE) is useful during the procedure and can identify the region of abnormal substrate during the procedure (Figure 1). Cardiac MRI (CMR) is the best imaging modality currently available to localise the region of scar defined by late gadolinium enhancement (Figures 2 and 3). Electrophysiologists need to anticipate epicardial ablation when significant scar burden is localised to sub-epicardial or epicardial region. Guidelines recommend that pericardial access be obtained prior to systemic anticoagulation or after reversal of systemic anticoagulation.23 There are observational data for safely performing pericardial access in heparinised patients at high volume centres with experienced operators.24,25 However, the authors caution against such an approach until further studies with larger patient populations are available. Anticoagulation can be administered to allow further endocardial mapping and ablation if pericardial entry is achieved without bleeding or with modest bleeding that stops. Continued monitoring for pericardial bleeding is warranted after anticoagulation. Our target ACT for right-sided endocardial ablation is around 250–300 s and left-sided endocardial ablation is 300–350 s with a target of 350s needed if long sheaths are used in the arterial system. Subxyphoid percutaneous epicardial access for VT ablation was first popularised by Sousa and colleagues.26 Their technique is the most widely used to obtain percutaneous epicardial access with minor variations by individual electrophysiologists. We perform subxyphoid pericardial puncture with a 17G-Tuohy needle with few modifications to the original description. The patient is generally placed under general anaesthesia for comfort and safety but can be done under sedation as long as the patient is comfortable without major movements. The starting place for entrance into the skin is approximately 1 cm below the subxyphoid process for an anterior approach and right under the rib margin adjacent to the xyphoid for a posterior approach. Local anaesthesia is administered in this region. Next, a decision needs to be made whether to enter the pericardium with an anterior approach or a posterior approach. Entering the pericardium away from ablation target sites is favourable for catheter manipulation and stability. The anterior approach involves a shallow angle to the skin and the posterior approach involves a deeper angle. Steep left lateral fluoroscopic views for an anterior approach and a left anterior oblique (LAO) and right anterior oblique (RAO) fluoroscopic views for a posterior approach help target the region of entry safely. RAO view locates the needle in the bas to apical axis (Figure 8A). LAO view marks the direction of the needle in anterior to posterior axis (Figure 8B). It is generally safer to enter away from the base where major epicardial coronary arteries are found. Distal left anterior descending artery is found at the apex and therefore targeting just posterior to the middle of the base to apical axis may be the safest approach. The Tuohy needle can be placed on the patient with the tip pointing towards the left shoulder and a brief fluoroscopic imaging in RAO projection will assess the angle of entry in the base to apical axis. Lifting the needle up and performing LAO fluoroscopy can assess the approximate angulation needed in anterior to posterior axis. Once the preliminary ‘best’ direction needed is assessed, the needle can then be advanced through the skin to the outer silhouette of the heart for few millimetres followed by removal of the stylet from the needle. At this point, a long guidewire is advanced through the needle. Small changes in the needle direction can be made as needed but we would recommend removing the needle all the way out of the body before major changes in the angle to prevent lacerating abdominal structures. The needle is advanced in small increments during expiration held 2/3 inspiratory effort when the patient is under general anaesthesia and the guidewire advanced out of the needle as soon as the needle penetrates the silhouette. When the needle reaches the heart border, ventricular pulsations will be transmitted from the needle tip. Premature ventricular contractions may also be seen. At this point a small contrast injection via the needle is optional and can identify tenting of the pericardium. Advancing the needle slightly with immediate advancing of the guidewire will safely obtain pericardial access. Often a ‘pop’ sensation is felt as the needle crosses the parietal pericardium similar to that noted when performing trans-septal puncture. Slight withdrawal of the needle once the guidewire is clearly within the pericardial space as one feels the ‘pop’ may reduce the risk of ventricular wall laceration. Most of the long guidewire should be advanced all around the pericardium. Fluoroscopy is used to identify the guidewire crossing multiple chambers that don’t share valves to rule out entrance in to the cardiac chambers. This is usually easiest to appreciate in the LAO projection as the wire will outline the silhouette of the heart border. Intracardiac echocardiography can be used to identify the guidewire in the pericardial space and to confirm that it is not in the cardiac chambers. At this point, a long sheath can be advanced over the guidewire. Deflectable sheaths can be useful during mapping and ablation in the pericardial space. The mapping and ablation catheters are advanced to the pericardium though the sheath to perform mapping and ablation. Epicardial voltage maps need to be interpreted with caution. Dense epicardial fat decreases the voltage but the myocardium below it could be completely normal. These regions of dense fat are often found at the base of the heart and along major branches of the epicardial coronary arteries. Late potentials and abnormally fractionated electrograms are not normal and often represent a region of abnormal conduction and scar. The direction of the ablator is important when assessing voltage and or ablation. The mapping or ablation catheter needs to point towards the visceral pericardium and away from the parietal pericardium during mapping and ablation. Epicardial fat can also impede lesion delivery to the myocardium of interest. The ablation catheter energy delivery electrode can heat up quickly and reach a temperature cut off and limit power delivery due to lack of blood flow in the pericardium. Therefore, cooling the ablator tip with irrigation is recommended to deliver adequate power. The irrigation rate may not need to be as high as required in the endocardium and care must be maintained to adequately drain accumulating fluid to prevent cardiac compression. Haemopericardium is a common adverse event seen with pericardial access, ranging from 5 % up to 30 % reported in literature.27,28 Pericardial bleeding can be categorised into early bleeding, bleeding during mapping and bleeding at the end of the procedure. Right ventricular puncture/laceration, coronary vessel puncture/laceration, and/or adhesion disruption are common reasons for early haemopericardium. Bleb rupture, multiple punctures especially in the setting of anticoagulation and steam pops with RF ablation can cause bleeding during mapping and ablation. Double right ventricular perforation could lead to extensive bleeding when the sheath is removed at the end of the case. Prompt diagnosis, assessment of extent of bleeding and strategy for containing or fixing the cause is critical and can be life-saving. As such, ICE plays a crucial role for identifying and managing this complication in our laboratory (Figure 1). ICE can identify the location of guidewire when gaining initial access. Inadvertent puncture of the right ventricle is easily diagnosed when the guidewire is seen in RV with ICE. Most bleeding with RV punctures from the access needle stop bleeding without any intervention as long as the sheath is not advanced over the guidewire into the RV. Lacerations are more likely to continue to bleed and require surgical intervention. Similarly, most small vessel punctures or adhesion disruptions also stop bleeding without major intervention other than aspiration of the blood from the pericardial space. Major vessel puncture or chamber laceration requires cardiac surgery or interventional cardiology. For these reasons we recommend epicardial ablation to be done only when surgical backup is available. Each electrophysiology (EP) laboratory needs to have rapid anticoagulation reversal and blood transfusion protocols in anticipation of potential major bleeding complications. Despite taking all the necessary precautions, occasionally surgical rescue is warranted to fix a complication. Electrophysiologists are advised to take this opportunity to perform intraoperative surgical ablation once the acute bleeding problem is managed and stability is restored. Hypotension during epicardial ablation requires close attention. The differential for hypotension includes tamponade, ECG changes or new wall motion abnormalities suggestive of coronary artery damage, drug reaction or anaesthesia-related complications. Intra-abdominal bleeding should be suspected when all of these are ruled out. The course of the left phrenic nerve needs to be identified prior to performing epicardial ablation. High output pacing, 20–50 mA at 2 ms pulse width, is used to identify the region of phrenic nerve capture on the electroanatomical map.31 When the critical region for VT circuit is adjacent to the phrenic nerve, the phrenic nerve in the parietal pericardium can be displaced by inflating a pericardial balloon prior to ablation.32 Instillation of air or saline can also displace the phrenic nerve from the ablation target site.32 The left phrenic nerve can be captured by pacing from the left subclavian vein.33 Constant phrenic capture can be demonstrated and monitored while ablating in proximity to the nerve but persistent capture with pacing at low output warrants manipulation of the phrenic nerve away from the epicardial surface. Ablating close to coronary arteries may lead to acute or chronic damage to these vessels.34 A coronary angiogram is routinely performed to outline the location of major epicardial vessels relative to the region of interest. The EHRA/ESC/ACC/HRS/AHA consensus statement on VT ablation recommends a distance of at least 5 mm away from coronary vessel for ablation before ablation is considered.24 Multiple angiographic views are recommended to assess the distance appropriately. Real-time integration of multidetector CT-derived coronary anatomy and CARTO-UNIVU has been utilised to better integrate the coronary anatomy with the electroanatomical map. Pericarditis is the most common adverse event of epicardial ablation. Adequate pain control immediately post procedure is required to minimise patient discomfort. Intrapericardial steroid injection at the end of the case has minimised pericarditis in in vivo animal studies35 and is commonly administered at a dose of 2–3 mg/kg of triamcinolone. Epicardial ablation is frequently required to control VTs in patients who harbour epicardial substrate and VT circuit. It can be safely performed by experienced electrophysiologists with adequate surgical backup to manage uncommon bleeding emergencies. Preprocedure planning is mandatory to anticipate when to perform epicardial ablation and possible challenges and contraindications for the procedure. Awareness of procedure-related complications and techniques for their management including haemopericardium, intra-abdominal bleeding, damage to intra-abdominal organs, phrenic nerve injury, damage to coronary vessels and pericarditis helps to prevent these complications and manage patients safely during ablation when these complications do occur. Preprocedural planning and preparation may identify the need for epicardial ablation for successful control of ventricular tachycardia with catheter ablation especially in patients with non-ischaemic cardiomyopathy. Twelve-lead electrocardiogram of ventricular tachycardia and ventricular bipolar and unipolar voltage maps contain valuable information to suggest epicardial exit and/or site of origin of ventricular tachycardia. 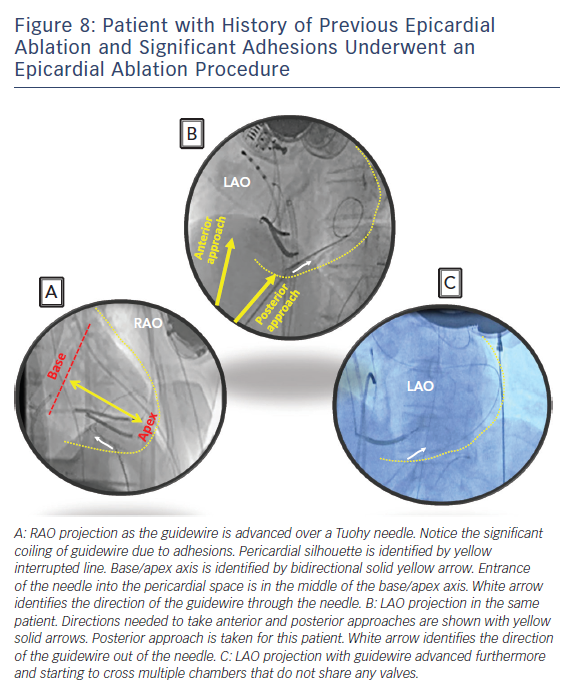 Understanding, anticipating and preventing potential complications is vital for a successful and safe procedure when epicardial mapping and ablation is performed. Gula LJ, Doucette S, Leong-Sit P, et al. Quality of life with ablation or medical therapy for ventricular arrhythmias: A substudy of VANISH. J Cardiovasc Electrophysiol 2018;29:1–14. Deyell MW, Steinberg C, Doucette S, et al. Mexiletine or catheter ablation after amiodarone failure in the VANISH trial. J Cardiovasc Electrophysiol 2018;1–6. Tung R, Vaseghi M, Frankel DS, et al. Freedom from recurrent ventricular tachycardia after catheter ablation is associated with improved survival in patients with structural heart disease: an international VT ablation center collaborative group study. Heart Rhythm 2015;12(9):1997–2007. Santangeli P, Zado ES, Supple GE, et al. Long-term outcome with catheter ablation of ventricular tachycardia in patients with arrhythmogenic right ventricular cardiomyopathy. Circ Arrhythm Electrophysiol 2015;8:1413–21. Muser D, Santangeli P, Castro SA, et al. Long-term outcome after catheter ablation of ventricular tachycardia in patients with nonischemic dilated cardiomyopathy. Circ Arrhythm Electrophysiol 2016;9:pii: e004328. Hsia HH, Callans DJ, Marchlinski FE. Characterization of endocardial electrophysiological substrate in patients with nonischemic cardiomyopathy and monomorphic ventricular tachycardia. Circulation 2003;108:704–10. Garcia FC, Bazan V, Zado ES, et al. 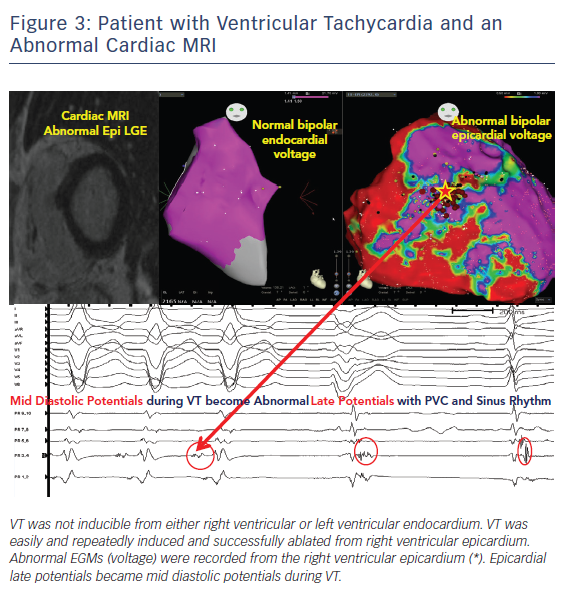 Epicardial substrate and outcome with epicardial ablation of ventricular tachycardia in arrhythmogenic right ventricular cardiomyopathy/dysplasia. Circulation 2009;120:366–75. Soto-Becerra R, Bazan V, Bautista W, et al. 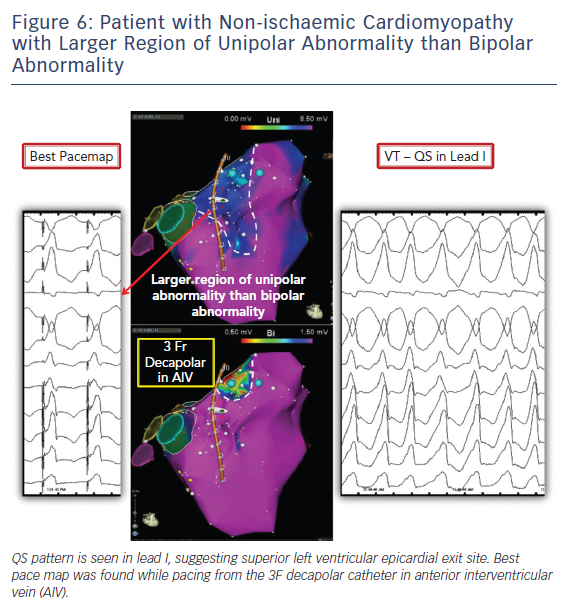 Ventricular tachycardia in the setting of chagasic cardiomyopathy: Use of voltage mapping to characterize endoepicardial nonischemic scar distribution. Circ Arrhythm Electrophysiol 2017;10:pii: e004950. Berte B, Sacher F, Cochet H, et al. Postmyocarditis ventricular tachycardia in patients with epicardial-only scar: A specific entity requiring a specific approach. J Cardiovasc Electrophysiol 2015;26:42–50. Dukkipati SR, d’Avila A, Soejima K, et al. Long-term outcomes of combined epicardial and endocardial ablation of monomorphic ventricular tachycardia related to hypertrophic cardiomyopathy. Circ Arrhythm Electrophysiol 2011;4:185–94. Lim PCY, Nademanee K, Lee ECY, et al. Epicardial ablation utilizing remote magnetic navigation in a patient with Brugada syndrome and inferior early repolarization. Pacing Clin Electrophysiol 2018;41:214–17. Valles E, Bazan V, Marchlinski FE. ECG criteria to identify epicardial ventricular tachycardia in nonischemic cardiomyopathy. Circ Arrhythm Electrophysiol 2010;3:63–71. Berruezo A, Mont L, Nava S, et al. Electrocardiographic recognition of the epicardial origin of ventricular tachycardias. Circulation 2004;109:1842–7. Hayashi T. Santangeli P, Pathak R, et al. Outcomes of catheter ablation of idiopathic outflow tract ventricular arrhythmias with an R wave pattern break in lead V2: A distinct clinical entity. J Cardiovasc Electrophysiol 2017;May;28:504–14. Polin GM, Haqqani H, Tzou W, et al. Endocardial unipolar voltage mapping to identify epicardial substrate in arrhythmogenic right ventricular cardiomyopathy/dysplasia. Heart Rhythm 2011;8:76–83. Betensky BP, Kapa S, Desjardins B, et al. Characterization of trans-septal activation during septal pacing: criteria for identification of intramural ventricular tachycardia substrate in nonischemic cardiomyopathy. Circ Arrhythm Electrophysiol 2013; 6:1123–30. Jauregui Abularach ME, Campos B, Park KM, et al. Ablation of ventricular arrhythmias arising near the anterior epicardial veins from the left sinus of Valsalva region: ECG features, anatomic distance, and outcome. Heart Rhythm 2012;9:865–73. Santangeli P, Marchlinski FE, Zado ES, et al. Percutaneous epicardial ablation of ventricular arrhythmias arising from the left ventricular summit: outcomes and electrocardiogram correlates of success. Circ Arrhythm Electrophysiol 2015; 8:337–43. Aliot EM, Stevenson WG, Almendral-Garrote JM, et al. EHRA/HRS expert consensus on catheter ablation of ventricular arrhythmias: developed in a partnership with the European Heart Rhythm Association (EHRA), a registered branch of the European Society of Cardiology (ESC), and the Heart Rhythm Society (HRS); in collaboration with the American College of Cardiology (ACC) and the American Heart Association (AHA). Heart Rhythm 2009;6:886–933. Page SP, Duncan ER, Thomas G, et al. Epicardial catheter ablation for ventricular tachycardia in heparinized patients. Europace 2013;15:284–9. Sawhney V, Breitenstein A, Ullah W, et al. 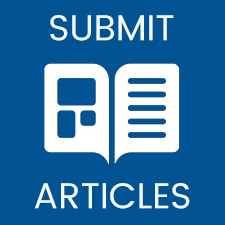 Epicardial catheter ablation for ventricular tachycardia on uninterrupted warfarin: A safe approach for those with a strong indication for peri-procedural anticoagulation? Int J Cardiol 2016; 222:57–61. Sosa E, Scanavacca M, d’Avila A, et al. A new technique to perform epicardial mapping in the electrophysiology laboratory. J Cardiovasc Electrophysiol 1996;7:531–6. D’Avila A. Epicardial catheter ablation of ventricular tachycardia. Heart Rhythm 2008;5:S73–S75. Tung R, Michowitz Y, Yu R, et al. Epicardial ablation of ventricular tachycardia: an institutional experience of safety and efficacy. Heart Rhythm 2013;10:490–8. Tschabrunn CM, Haqqani HM, Cooper JM, et al. Percutaneous epicardial ventricular tachycardia ablation after noncoronary cardiac surgery or pericarditis. Heart Rhythm 2013;10:165–169. Soejima K, Couper G, Cooper JM, et al. Subxiphoid surgical approach for epicardial catheter-based mapping and ablation in patients with prior cardiac surgery or difficult pericardial access. Circulation 2004;110:1197–1201. Fan R, Cano O, Ho SY et al. Characterization of the phrenic nerve course within the epicardial substrate of patients with nonischemic cardiomyopathy and ventricular tachycardia. Heart Rhythm 2009;6:59–64. Di Biase L, Burkhardt JD, Pelargonio G, et al. Prevention of phrenic nerve injury during epicardial ablation: comparison of methods for separating the phrenic nerve from the epicardial surface. Heart Rhythm 2009;6:957–61. Santangeli P, Marchlinski FE. Left phrenic nerve pacing from the left subclavian vein: Novel method to monitor for left phrenic nerve injury during catheter ablation. Circ Arrhythm Electrophysiol 2015;8:241–2. D’Avila A, Gutierrez P, Scanavacca M, et al. Effects of radiofrequency pulses delivered in the vicinity of the coronary arteries: implications for nonsurgical transthoracic epicardial catheter ablation to treat ventricular tachycardia. Pacing Clin Electrophysiol 2002;5:1488–95. D’Avila A, Neuzil P, Thiagalingam A, et al. Experimental efficacy of pericardial instillation of anti-inflammatory agents during percutaneous epicardial catheter ablation to prevent postprocedure pericarditis. J Cardiovasc Electrophysiol 2007;18:1178–83.